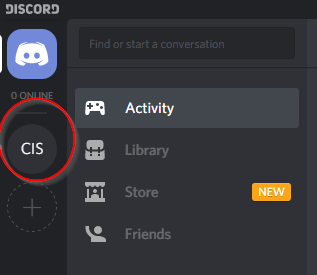 On the Skype/Discord computer, open the Discord app (it should be running). Then click the Meeting Audio to join the Church to the audio channel. This is what allows others to hear the meeting. 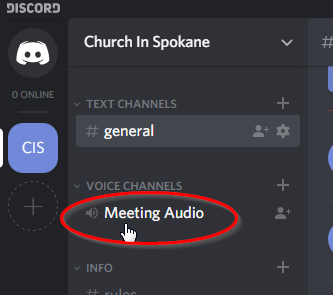 The Church In Spokane Audio user name should appear under the Meeting Audio. Other users may have already joined. Now you can begin to setup for recording the meeting. Copy to the Kiosk computer. Copy the Loaner Thumb Drives. Start Sound Forge Audio Studio. Prepare to Tag the recording. Select one of the wireless handheld mic's to use for tagging. Any will work as long as the receiver is turned on. Insure the battery is good (change the battery if needed). Insure the receiver is turned on. In the picture below Lav 1 is on, Lav 2 is off and both handhelds are on. 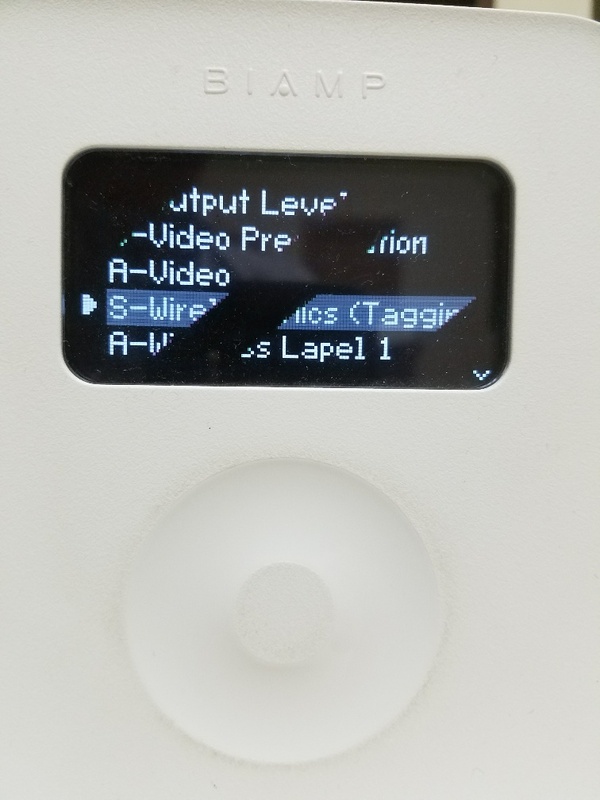 Set the selector to S-Wireless Mics -Tagging (using the white box control device). Turn the mic on and make sure you are getting a signal on the receiver in the equipment rack. If using the Lavilear mic, clip the mic onto your clothes if you don't want to hold it, or if it is a hand held mic, hold it near your chin--out of the path of the breath of your mouth. Get into position to tag the recording--at the PC ready to start recording. Speak a little to test and make sure the level indicators are moving with your voice and that they go up to at least 24 on the dial. Above 12 would be better, but not clipping (turning red). Re-position the mic as necessary to get the signal level to the desired reading. If needed, use the printed documentation that has an example of the 'script' for tagging various meetings. The red target will turn into a blue square Stop 'button'. Tag the recording. Poke the Stop button when you are done tagging. As you are tagging you should have seen the level indicators moving. A peak value (shown at the top of the recording bars) close to 0 is ideal, as shown above. The level got into the 'yellow' zone but not the 'red' zone. When finished tagging, turn off the handheld mic (push and hold the on/off switch) and put it away. Get out a Lav mic for the sharing brother, turn it on and make sure the battery charge is good. Replace the batteries if needed. Insure the Lav 1 receiver is ON and Lav 2 is off. Set the system to record singing and sharing. Set the white box to 'S-Sharing'. When you are ready to start recording the meeting, click on the red target 'button' icon again to start recording. You will see a red box flash on the word recording when recording is happening. Prepare for recording the brothers who will open and optionally close the meeting. There will almost always be a brother who will open the meeting. Many times there will be another brother who will close the meeting. Check the posted schedule to know for sure. Insure the Lav mics are on (Lav 2 only if there is a closing brother) and the buttons are locked. To lock the buttons, press and hold the on/off and the lock button at the same time. A lock symbol will appear. 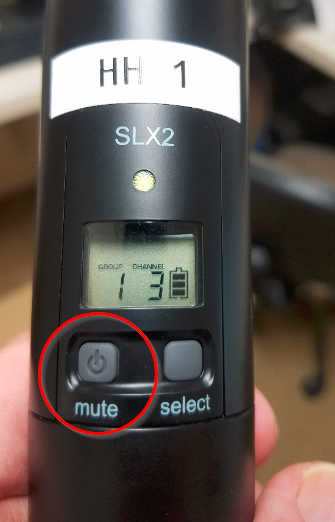 Ad the end of the meeting, in order to turn the mic off, you will have to unlock it the same way you locked it. Give Lav 1 mic to the brother who opens the meeting. Give the Lav 2 mic to the brother who will close the meeting if there is such. Insure the Lav 1 receiver is ON and that the Lav 2 receiver is OFF. See picture above. Switching for the Opening Word of the Meeting. The goal is to switch the mics from 'Sharing' to 'Wireless' when the brother opening the meeting is about to begin speaking, then back to 'Sharing' when he is finished. Be vigilant to when the brother will start speaking. Position yourself either in the A/V equipment room or the A/V booth--both have a white box you'll need to make the changes. When the brother begins to speak, switch from S-Sharing to S-Wireless Mics (Hall). This is the selection item directly above Sharing. See picture above. Listen in the headphones to insure the brothers speaking can be heard. Go to the PC and check that the level is appropriate. Adjust it if not using the appropriate adjustment setting on the white box (e.g. A-Wireless Lapel 1), or adjust the input level on the headphone amp (black box with 4 knobs--adjust the knob associated with the recording computer). Switch back to Sharing when the opening word is complete. When the brother is about to finish, position yourself near a white box. When he finishes, switch back to S-Sharing. Prepare for the Closing brothers sharing. IF there will be a brother closing the meeting, go to the A/V equipment room. Turn OFF the Lav-1 receiver and turn ON the Lav-2 receiver. Switching to Closing Word recording. When the brother who will close the meeting stands up, position yourself near one of the white boxes. The A/V Booth is best as you can see what is going on in the hall. 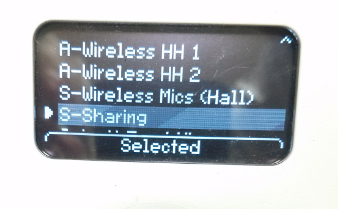 When the brother begins to speak, switch for S-Sharing to S-Wireless Mics (Hall). Listen on the headphones to insure the brothers speaking can be heard. Go to the PC and check that the level is appropriate, making any necessary adjustments. When the closing brother is about to finish, visit one of the white boxes. When he finishes, switch to S-Sharing. This will insure we capture all the announcements. Select the Save icon (looks like an old floppy disc) and the Save As dialog box will appear. Notice we are in the ThumbDriveMeetings folder, the name of the file is the date of the meeting, and the type is MP3. Note, that it may take up to 2 minutes for the file to save. Use the Windows file explorer and navigate to the ThumbDriveMeetings. There should be a shortcut to that folder on the computer desktop. You should see the recording you just made. It should be at the top of the list if the sort order is by date. This process should take only a few seconds. Unplug the Master Thumb Drive from the PC take it over to the Kiosk machine. Copy the MP3 file to the desktop of the Kiosk PC. Plug some Loaner Thumb Drives into the available USB ports. In a similar manner as you used to copy the recording onto the Master Thumb Drive, copy the recording to the Loaner Thumb Drives. There are several techniques that can be used to do this. One is shown above, but you may want to use another approach. By whatever means you like, copy the recording onto the loaner thumb drives. Hang the Loaner Thumb Drives up for the serving ones to take. NOTE: We no longer provide loaner thumb drives. After 2 cases of thumb drives never came back, we decided that anyone who wants a copy of the recording needs to provide their own thumb drive.